KNOW YOUR TECH breaks down the scientific technology used in your favorite sneakers and activewear. 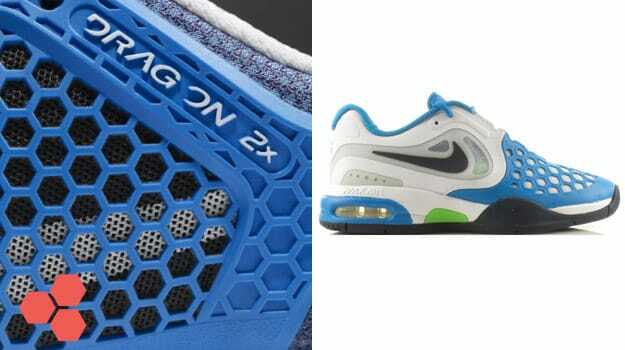 Let’s demystify your next purchase: today’s technology is Nike Drag-On 2X. This durable material is used as an overlay on many of Nike&apos;s tennis sneakers, including the Nadal-endorsed Air Max Courtballistec 4.3. Due to the rigors of the game and the tough surfaces it&apos;s often played on, it&apos;s important for tennis sneakers to be built with abrasion-resistant materials that can withstand a beating on the courts. What is it? Nike Drag-On 2X is a technology in which durable mesh in enclosed by a synthetic hexagonal-patterned overlay. This allows sneakers which use Drag-On 2X to be breathable, flexible, and durable all at once. How does it work? The synthetic hexagonal overlay of Nike Drag-On 2X technology leaves plenty of breathing room for the open mesh layer, allowing for high levels of ventilation. It&apos;s also strategically applied to provide flexibility, but the key factor of Drag-On 2X tech is its durability. Bottom line: The resilient yet flexible properties of Nike Drag-On 2X can benefit players of all levels.